Last month I arrived in Hanoi, Vietnam after spending three months in Mysore, India studying Ashtanga at KPJAYI. During this time my husband, Dominic, got a head start in Vietnam, beginning the foundation for our new lives in Hanoi. It was challenging being apart for three months, but thanks to Skype and a fast wifi connection, we managed. I always like to write about my first impressions pretty soon after arriving to a new place. I have found this method works best, as when things are new the mind picks up on the unfamiliar with greater detail. It’s during this beginning stage (the first few weeks to a few months) when the traveler gets that “high” from being in a new place. Everything is intoxicating, everything is fresh, and everything is exhilarating and new. But these thoughts must be jotted down quickly, before the unfamiliar turns familiar…. Vietnam is abrasive. Colorful. Stinky. Vivid. Funky.Unpredictable. And I’ve never seen so many dead animals on the side of the street, or for that matter half-alive animals.I’ve seen monkey brains, y’all. And even though I live in the city, it’s still retained some rural aspects. My neighbors have chickens and pigs. Once a week during my morning practice I can hear a pig being slaughtered. It’s unsettling, especially being a vegetarian. I’m not sure if you have ever heard the sound of a pig being slaughtered, but it sounds much like a human, and it’s bone chilling. Dom and I have found a cute French colonial inspired house that we share with two Aussie guys. We found it on Hanoi’s Facebook page, Hanoi Massive, and it’s only $250US a month. The house is huge and has four floors, lots of light, wood floors, French doors, and a massive kitchen overlooking a garden and coy pond. The house is surrounded by high walls, and with the lush garden and tall banana trees it doesn’t even feel like we are even in Hanoi. The other options for us were small apartments starting at $500US. Since we weren’t sure of how long we were staying, we opted for more space for less money before signing a lease anywhere. Plus, $500US doesn’t get you much in terms of apartment living. View of the garden from our kitchen. We live in the Tay Ho area. We actually live in Au Co, which is a 5 minute walk to Tay Ho, and only separated by one busy road, but on this side the rent is significantly cheaper. They are seriously having a laugh with the rent prices in Tay Ho. Our place is really cozy, and to be honest, I don’t really leave our house too often. I work entirely online now, so besides leaving the compound for my weekly massage (guys I’ve found the best massage therapist in the world! And it’s only $15US for 90 minutes) and the occasional weekend trip, I stay indoors. I’m absolutely terrified of navigating the polluted streets here. I wouldn’t dare ride a scooter, however I have braved taking a bicycle onto the chaotic streets a few times. Thankfully, Dom does all the grocery shopping and I prepare all of our meals at home apart from a weekly visit to the Italian owned pizza restaurant, Da Paolo’s. I did eat out two times at other places while being here, but I got food poisoning BOTH times. Now, this is from a person who was in India for three months and did not get food poisoning once. I’m sure I just got unlucky, but in the meantime I prefer to stay on the safe side and cook all of our meals. Luckily, our home has a massive modern kitchen. So without further ado, here you have it. 1. The Traffic is Insane! First of all, everything here is so mental. I’ve lived in places with crazy scooter traffic, such as Indonesia, Taiwan, and India, but Hanoi takes the freaking cake. Here is why: Scooters are a relatively new concept in Vietnam. Up until the 1980’s the bicycle was the main mode of travel. And cars have just become common in the past 10 years. Car sales keep on rising dramatically, so I don’t see the traffic problem getting better in the near future. The public transportation here is a bit of a joke. The city is currently building a sky rail, but no one seems too hopeful that this project will be finished anytime soon. In light of vehicles being a “new” concept here, my theory is that people are still trying to figure out how to do the moving vehicles dance. In Taiwan the surplus of scooters has a rhythm, as there is an “organized chaos”. But not here. Some people may disagree, and they might have a point as there is a minute degree of organization, but there is SO much room for improvement. This is why Dom and I have opted out of riding a scooter while in Vietnam. 2.The pollution is worse than Beijing! The pollution is bad here, y’all. As Dom said the other day, “It makes Kaohsiung seem like Switzerland”. When we researched Hanoi, we knew the pollution wasn’t going to be the best, but we didn’t know it would be this bad. From what I gather, even up to three years ago it was a lot better, but with the massive influx of factories, vehicles, and complete disregard for the environment, it has accelerated at an alarming speed. So much so that the air quality is often much worse than that of Beijing. We are in the land of no CostCo! It’s not like in Taiwan where we could zip on over and buy bulk amounts of frozen blueberries, organic peanut butter, and bags of walnuts. It’s far from it. I haven’t even seen blueberries here. I saw organic strawberries the other day and they were $13US for a few cups. I ended up buying them because dammit, sometimes you just want to make gluten-free, strawberry pancakes! Nuts might as well be gold here, as a bag of walnuts that would cost $14US in Taiwan cost $55US here. Chia seeds can be found but for an extravagant amount, and it’s impossible to find most other super foods like hempseeds, plant based protein powder, or raw cacao. In Taiwan, I could have most of these things shipped from iHerb, but the postal service is not reliable here. It is even – from what I’ve been told – downright corrupt. I know that some of you are thinking, well if you live in Vietnam you should just eat local. Well first of all, I’m vegetarian, so that can be an issue sometimes. Second, I’m an expat. I’m not living here to eat like a local. I’m living here for the opportunity to enjoy a comfortable way of life outside of the rat-race of the U.S. In light of this, when Dom and I choose a new place to live, comfort is one of the factors. And food is a huge part of this. When it comes to experiencing a new culture, the agenda of the expat is different from that of the traveler. 5. Choices are limited for weekend getaways. Getting away for the weekend is difficult here. Ninh Binh is gorgeous and can be reached in a two-hour bus ride which is great. But besides that, and perhaps a few other destinations (Halong Bay or Cat Ba if you like that touristy trap kind of thing) it’s not so easy, unless you do it by air. To me, the only way living in a gas chamber is doable, is if you can get the hell out of dodge in less than an hour. Okay, so at this point you might be thinking well if you don’t like it so much than move! Well amigos, that is exactly what we are doing. Dom and I have booked a ticket back to Kaohsiung on June 14. All in all, Dom and I decided to move to Hanoi because we heard excellent things about the high quality of life for expats. 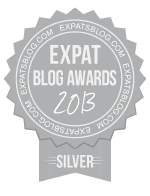 On expat’s blogs we read of high wages for teachers, low cost of living, good food, etc. However, we have been disappointed with what we have found. Yes the wages are high, and yes the cost of living is low, but the air pollution is just too awful to ignore. I’m sure 3-5 years ago Hanoi was a better place to live, as the pollution wasn’t as bad then. But today, it is hazardous and life is just too short (and it will definitely be shorter if we stayed here!) to live in a place where the sky looks apocalyptic. And although Vietnam makes a great place for an extended vacation, we just didn’t seem to jive with her for long-term living. So back to Taiwan we go! The land of stinky tofu, vegetarian cuisine, and CostCo. And more importantly, that sweet, sweet, East Coast. An art gallery in Hoi An. I’m a Hanoian who has lived abroad for a long time and completely agree with what you wrote – traffic, pollution, dirty streets, etc. (unfortunately no other Hanoians I know agree with me). Thank you for the advice, Anna! I will look around for “com chay”. I did go to one vegetarian place close by (a cute little hole in the wall that seems to be popular with the expats) but I ended up getting sick afterwards. It can happen anywhere though.